Mongolia's pipeline of new coal projects and the potential development of Rio Tinto's Tavan Tolgoi coal project will see the country's overall coal output grow at an accelerated pace. 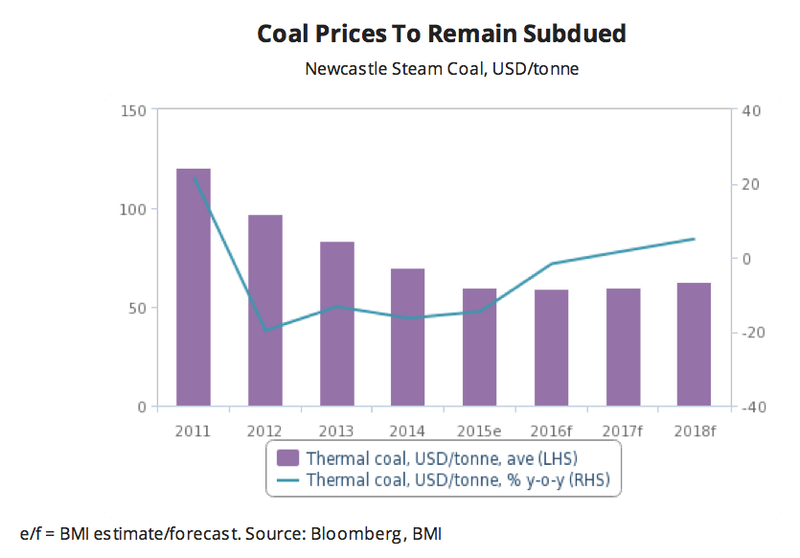 However, China, the major importer of Mongolian coal, will increasingly jeopardise Mongolian miners' expected revenues with slowing demand for coking coal. This will necessitate Mongolian miners' to shift exports to other markets to enhance cost effectiveness in production. Other than China, Russia is the only other, albeit much smaller market Mongolia currently exports coal to. We forecast Mongolian coal production to grow from 36.6 million tonnes (mnt) in 2015 to 56.2mnt in 2020, representing an average output growth of 9.1% during 2016-2020. While coal miners in Mongolia are set to tap into Chinese demand for coking coal for steel production, demand will continue to decline. We expect China's steel production, the source of demand for coking coal in the country, to register a steady decline averaging -1.3% y-o-y over 2016-2020, compared to a 4.9% growth over 2011-2015. 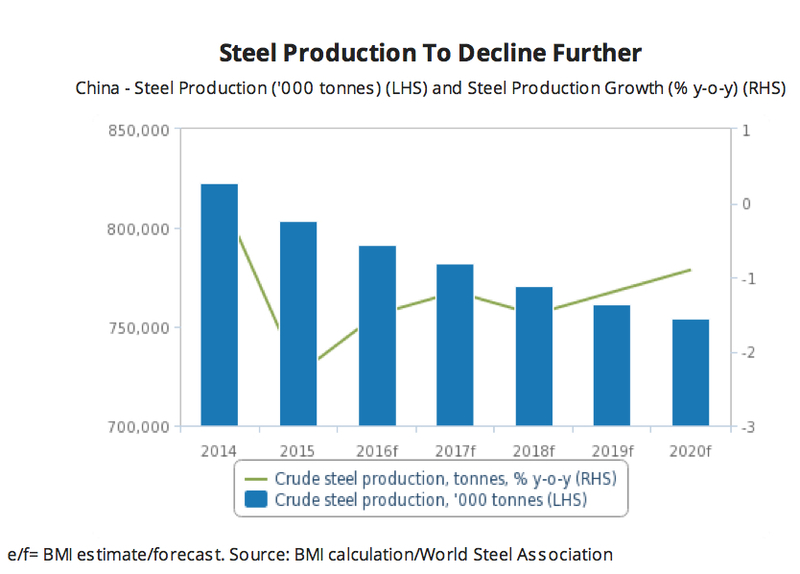 Production growth in China, the world's largest steel consumer, has peaked and will remain weak due to low prices and a slowdown in Chinese fixed asset investment and thus the construction sector. Consolidation will only gather pace after 2016, as there will be significant reluctance to close down steel mills and reduce workforce at a time of generally slowing economic growth. Furthermore, increasing trade tensions within the global market, due to accusations of Chinese steel dumping, will pressure the Chinese government to scale back domestic steel production and exports over the coming years. Mongolian miners will increasingly look to other markets with high steel production including India to maintain profitability. 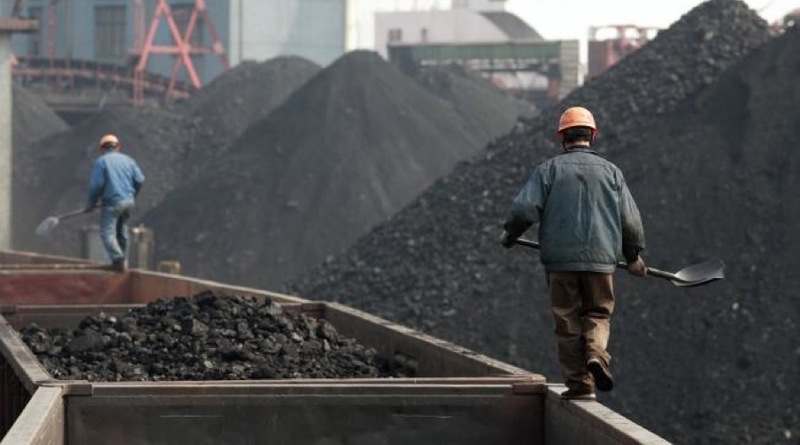 Additionally, even the little amount of thermal coal Mongolia exports to China will see falling demand largely due to the government's commitment to cutting pollution and halting environmental degradation. 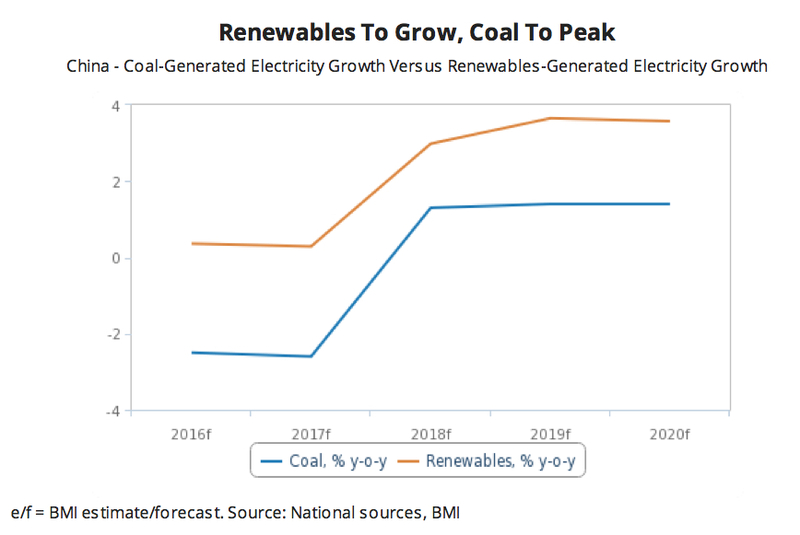 We forecast coal's share in China's energy mix to fall from 64.4% of total electricity generation in 2016 to 54.0% by 2025. Although Mongolia's close proximity to China, the world's largest coal importer, and high-quality coal grades will help Mongolia maintain its position as a leading supplier, declining Chinese demand will substantially reduce revenues. 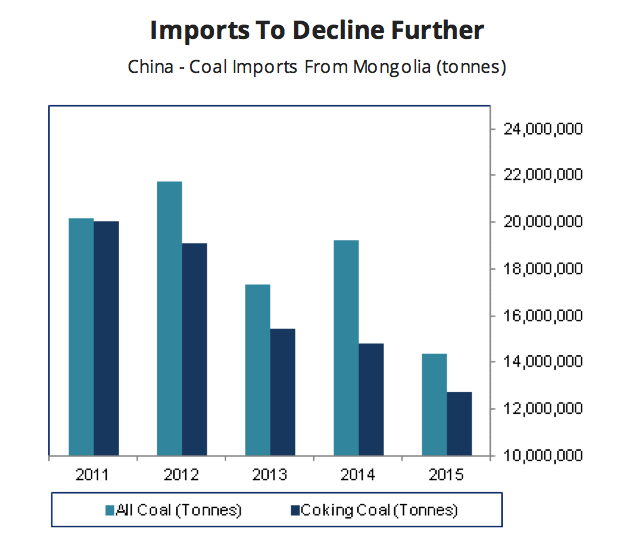 In 2015, Mongolia's coking coal exports to China decreased to 12.7mnt from 14.7mnt in 2014. We expect this trend to continue. With China being the major export market for Mongolia, Mongolian miners will increasingly need to look to other markets. India will serve as a potential export market for Mongolia while China reduces demand. 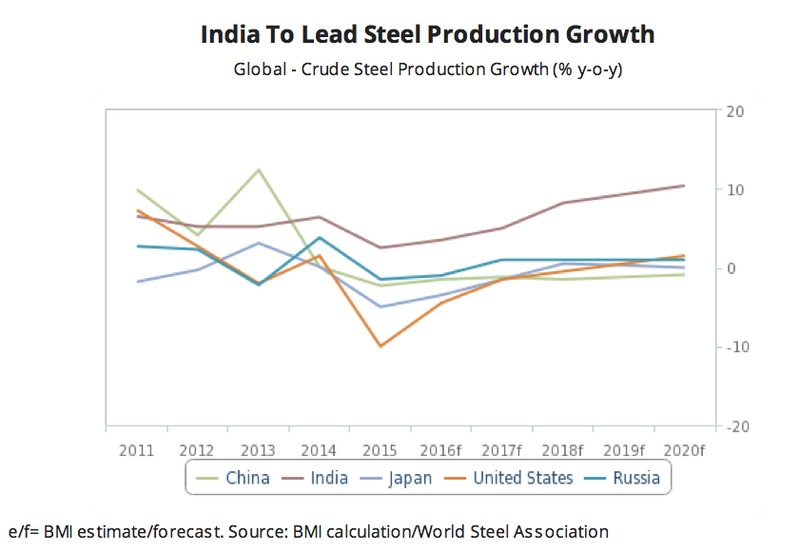 India will be the global steel productiongrowth bright spot as demand from the construction, automotive and infrastructure industries continue to accelerate. We forecast India's steel output to average annual growth of 7.3% during 2016-2020, higher than 5.3% during 2011-2015. India's steel output will grow from 92mnt in 2016 to 126mnt by 2020. The country's share of global steel production will accelerate from 3.5% in 2016 to 10.4% in 2020. The government has been spearheading the push towards the boost in steel production capacity, with upgrades being made to existing steel mills and state-owned companies stepping in to build new steel plants. Key companies that will drive growth are Steel Authority of India Limited(SAIL) and Tata Steel, the latter which aims to boost sales in the automotive segment with the migration of production towards higher-end steel products. Additionally, Mongolia can also transport thermal coal to India as the country will continue to suffer from persistent thermal coal deficit and energy poverty over the coming years. Although domestic coal production growth is rising, lack of transport infrastructure and low coal prices will ensure that India's demand for seaborne coal remains strong. As a result, Mongolia may turn to India while China reduces demand capacity although transport networks to India remain a challenge. Low coal prices will drive Mongolia's coal miners to reduce costs and increase operational efficiency at the firm's mining assets. Miners will increasingly need to diversify their operations and enhance operating efficiency in order to maintain profitability at a time when coal prices are weak. Additionally, Mongolia's development of rail infrastructure will increasecost-efficiencies and enhance producer margins. For instance, in October 2015 Mongolia signed a Memorandum of Understanding with Japan to cooperate in the Tavan Tolgoi eastern railway project. The project involves a 1,300km rail line eastward from the mine to markets in Japan and the US. Additionally, approval for construction of a 267km rail line from the mine to Gashuun Sukhait on the border with China will allow coal to be transported directly by rail instead of by truck, achieving significant cost savings. The approval of the Erdenet – Ovoot – Arts Suuri Railway will also increase supply chain connectivity for the coking coal sector in the north of the country. Upon completion the line will be able to transport 100.0mnt per annum of coal, increasing the country's access to Russian, Chinese and seaborne coking coal markets. This article was contributed by BMI Research.